Goldman Sachs is replacing one earnings problem with another. The bank left behind years of ho-hum profit with an estimate-beating $2.75 billion in the first quarter. That equates to an annualized return on equity of 14.7 percent, which is arguably at the upper end of what a player like Goldman can expect to earn. The firm kept costs down, but trading accounted for much of the boost. That means the improved returns come at a higher risk. Revenue from Goldman’s fixed income, currency and commodities (FICC) desks only rose by a tenth from the same period last year. But the top line rocketed 157 percent from the fourth quarter. That’s courtesy of various central bank actions during the first three months of the year that drove up both volatility and trading volume in interest-rate and foreign exchange products. Such a strong showing lends weight to Goldman’s belief that trading should remain its most important business. The bank has made far fewer changes to this business in recent years than virtually all of its investment-banking peers. That’s fine if performance remains steady. But trading is a fickle business and big swings in revenue have a greater impact on Goldman’s performance than at more diversified rivals like JPMorgan. FICC accounts for almost a third of Goldman’s revenue. Add in equities, where revenue rose by a fifth since December, and trading makes up half the top line. A drop in volatility, or being caught on the wrong side of too many trades, would do more damage to the bank’s returns than to competitors’ performance. That’s true despite a strong quarter for investment banking and a solid one for other business lines – and despite impressive control on the cost side. The amount set aside for compensation, for example, was just 42 percent of revenue, the lowest it has been in a first quarter since the bank went public in 1999. Other costs fell 3 percent from the first quarter of 2014. Shareholders have shown their appreciation of late by taking Goldman’s stock above $200 a share for the first time since May 2008. But they shrugged at Thursday’s report. That may be because hefty trading revenue comes with questions about how sustainable it is – and how to value a company with what may prove to be see-sawing profit. 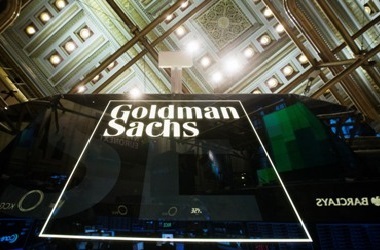 Goldman Sachs on April 16 reported first-quarter net income applicable to shareholders of $2.75 billion. At $5.94 a share it beat the consensus estimate of sell-side analysts of $4.26 a share. The company’s annualized return on equity in the quarter was 14.7 percent, and the firm set aside $4.46 billion to cover compensation. At 42 percent of revenue, that’s the smallest proportion the bank has set aside to cover pay and benefits in any first quarter since going public in 1999.